I’m using LanguageTool 1.6 with LibreOffice 3.4.5. When I have a sentence ending with an interrogation point preceded by a fine non-breakable whitespace, it is flagged as incorrect and LanguageTool propose to replace it by a normal sized non-breakable whitespace. This is incorrect, because it should be a fine non-breakable space, not a normal sized one. On top of it, the rule in French says “Insert fine non breakable whitespace” so it seams it should do what I expect of it. If I desactivate the rule, I have no more this error pointed out, but neither I have if there is no space, which is far more incorrect. I didn’t know where to put the bug report, so posted there. : I’m using LanguageTool 1.6 with LibreOffice 3.4.5.
: to replace it by a normal sized non-breakable whitespace. 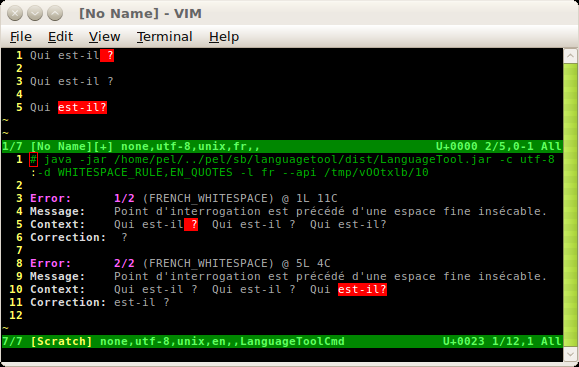 LT flagged sentences #1 and #3 as an error (FRENCH_WHITESPACE) as expected. LT did not flag sentences #2 as an error, which is also expected. So it seems fine to me, or am I missing something? I tried from LT in command line (in Vim) as well as in LibreOffice. 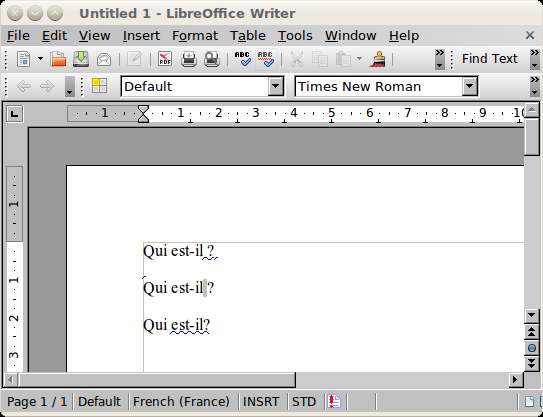 I precise that I used LibreOffice-3.3.2 in Ubuntu-10.04. I also precise that accepting the correction proposed by LT worked fine (left click on the error and select the proposed correction). Correction inserts a non-breakable space before the question mark as expected. It should not be a non-breakable space, but a fine non-breakable space. I added a bug in the tracker.